Jami and Matt are a couple that when you meet them you just know that these two were made for each other!! They met at the coffee shop where Jami worked when Matt would come in on Fridays to grab a cup of joe. He was her "Friday Guy" and she was the "Mystery Girl" behind the counter. Once they got to know each other it was a sure thing that these two were meant to be. 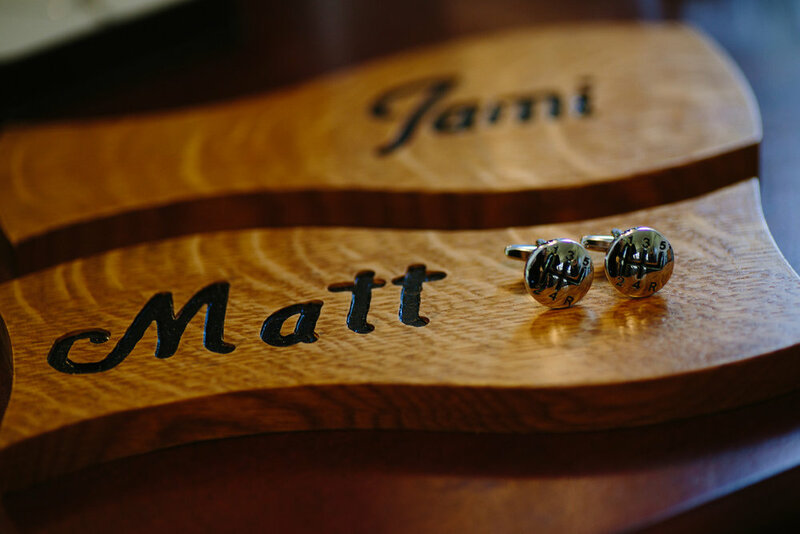 Their wedding day was so special as it was held on Jami's family farm in Hillsborough, NC. Circle M Ranch was all dressed up that day in full Fall fashion with mums, hay bales, and a tractor bar. Jami looked amazing in her gown with pearl under-lay and side-swept hair. Matt is a big car buff and showed off his gear shifter cufflinks to everyone. The bridal party wore plum and everyone was bundled up for what turned out to be a cool and breezy October day. The sunlight was spectacular though as the couple took sunset photos under the giant oak trees on the farm. The two coffee lovers sipped to stay warm and hosted a coffee bar for all of their guests. In the reception barn, guests were treated to dinner and dancing for the rest of the evening. All the best to this amazing couple!! I know they will be laughing and dancing with each other as they begin their journey as Mr. and Mrs.! How do I make a guest list?